Stumps - provide so many different learning opportunities, they are not just for climbing or sitting on! 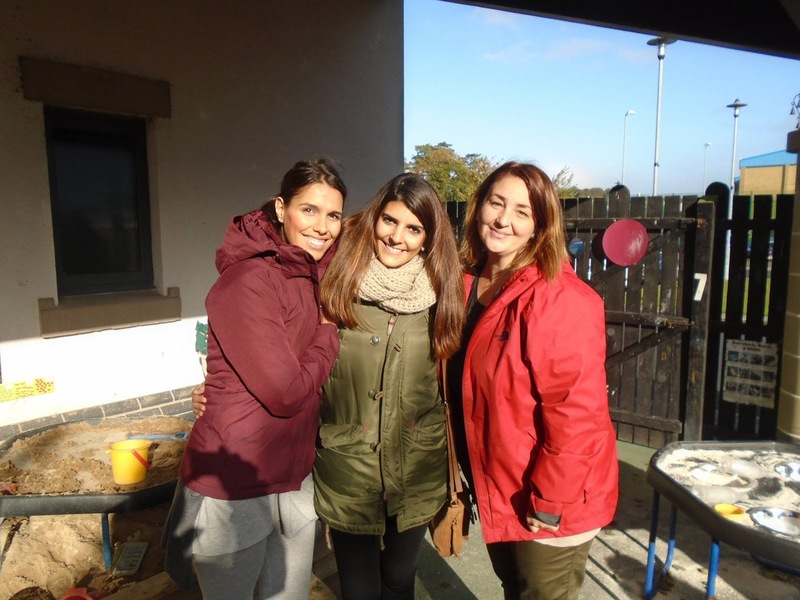 This past month we have had 3 teachers working in the nursery & Primary 1 from Madrid, they were over as part of an Erasmus Plus Job Shadowing opportunity & spent the 4 weeks observing practice in both classes and gathering information on how to create a more inclusive ethos in their school. Marta, Rosa and Maria from Madrid. The Principal was one of the 3 visitors and on her first day in nursery was a bit worried about being back in the classroom after 9 years out in a management role but she very quickly was able to get back into a more hands on mode. She was a very warm person and the children were drawn to her to read them books etc. I had sent them an email to warn them that they'd be spending the first hour outside when in the nursery and at first they thought I was joking but when they realised I was serious they all came well prepared to be outdoors no matter what the weather. On the first day in the nursery there were lots of questions being asked mostly about the weather - I don't think anyone had prepared the poor Spanish for our grey skies and lack of sunshine! 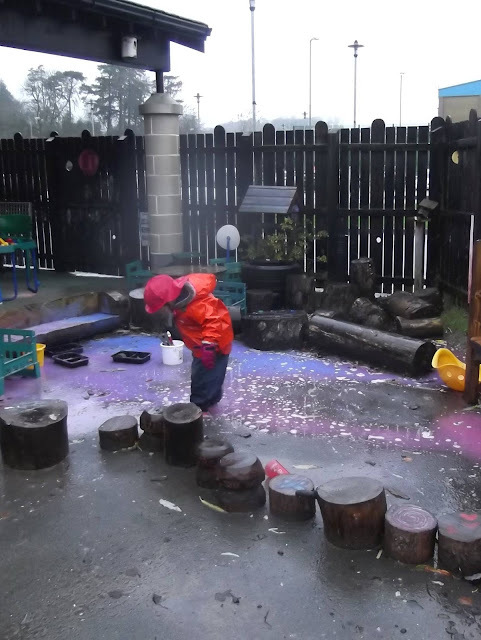 They couldn't get over the fact that the children were all happy to be outdoors even on a cold & damp morning, they wanted to know why the parents weren't complaining about their children being outside, they asked would we go outside in heavy rain or snow? I remember asking similar questions when I visited a kindergarten in Norway. They were also quite taken aback at some of our resources - weren't the tree stumps too dangerous? What if the children fell while climbing on them? Didn't they get slippy in the damp weather? At first I could see that the Principal was a little stressed as she watched children climbing on the planks, logs and stumps and she rushed to help children who fell or slipped but gradually as she spent more time watching them and us & how we reacted to falls etc. she began to relax. After a couple of days, we had a conversation about what she had observed so far and it was wonderful to see how much she had taken on board in such a short time. It reminded me that sometimes we do need to see things first hand for us to really 'get it'. She explained how she had realised that while the children might stumble or fall on the slippy logs, they all got up and went back to keep on trying, she had watched them practising again and again until they knew which ones were wobblier or slippier than the others and how some would jump down and skip over those ones whilst others would just take it more slowly. Most of all it was our reactions that she had picked up on - we didn't rush over making a big fuss is a child fell, instead all adults stayed very calm and as a result, unless badly hurt, most children were happy to get some sympathy and just keep on climbing. Even if a child who was crying and upset they liked that we had a designated seat for the injured child to rest on while 'Mr Bump' was applied & then they would just get up and continue to play. 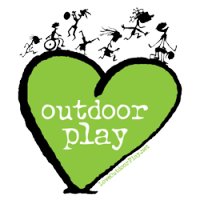 A few days ago, this article about risk in outdoor settings was shared on social media https://tinytrees.org/2017/10/17/how-safe-are-outdoor-preschools-results-from-a-uw-study/ and it made me think about how we, as adults, can worry too much about the whole 'what might happen if..' scenarios when we think about young children taking risks. 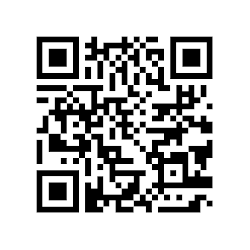 We have lots of life experience and obviously a lot more than the children in our care but we also have to stop ourselves from always thinking of the worst case scenario. In my experience a child who falls off a log when climbing will rarely be off climbing ever again, yes they might get a scrape or bruise but they also know that it won't happen every time they climb. As someone once pointed out, if a baby gave up trying to walk every time they fell, none of us would ever have learned how to walk. 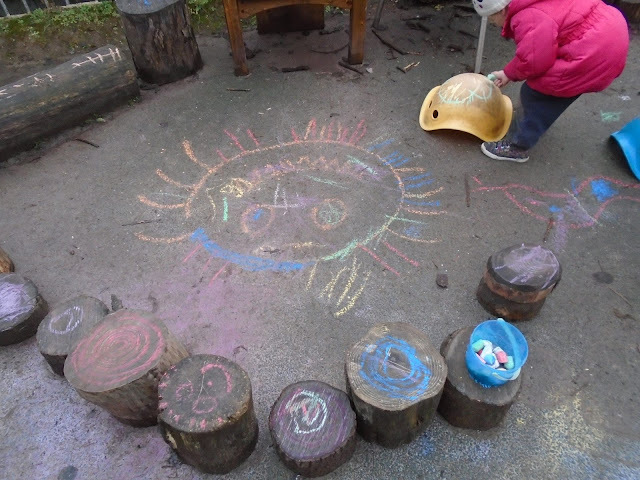 After 4 weeks in the nursery, the visiting teachers could see that the children were very happy outdoors, they were busy and purposeful in their play. The principal could see that there were less arguments outdoors and most of all she kept saying 'Your children are all so happy, there is no crying' and she could see that they were ready for more settled play when we moved indoors too. Sometimes it is good to have another person question your practice and make you explain why you do things a certain way or have particular resources, it is always good to reflect on your practice. I prefer a child who knows their own mind and doesn't others to enjoy playing somewhere. "No one will play with me"
"X won't play with me"
"I have no one to play with"
"I want to sit beside X"
"I don't want to sit beside X"
"X isn't my friend anymore"
Anyone who works with preschool children will have heard these phrases and many other variations throughout the school day. The children in nursery are aged between 3 and 2 months and 4 and 2 months when they start school in our system in N. Ireland and sometimes we, the adults, forget that is a very short time to have been on this planet and that there are so many new emotions and experiences to be had once they are in a much bigger group of peers. many of the children in my class come into nursery straight from being at home with a parent/grandparent or carer, some will have siblings, some won't and others will have been with other children in daycare or with a child minder but I can guarantee none of them have been in a group with 26 other peers and just 2 adults for the majority of their day. 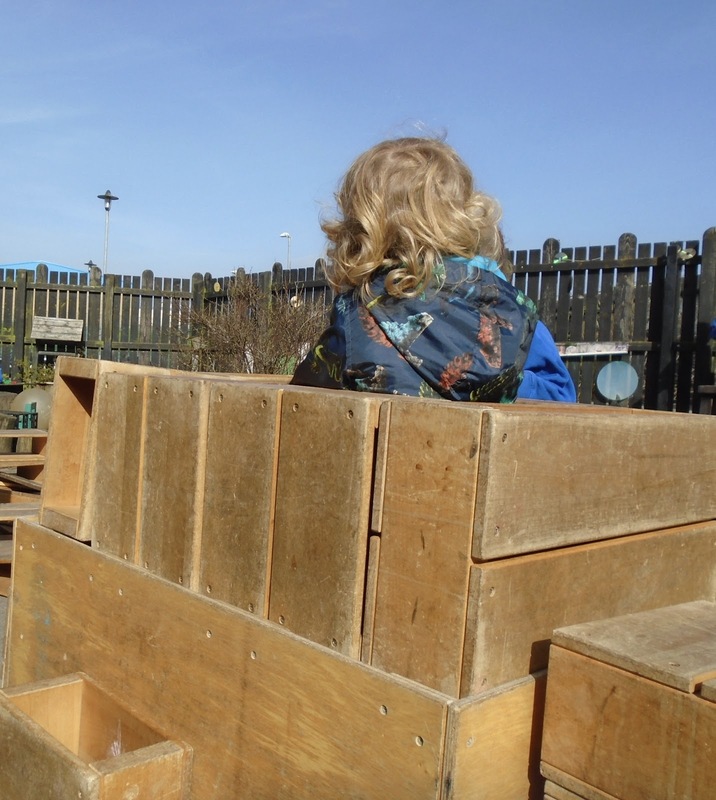 I feel that anyone can enjoy these stages of play at different times of the day and not just as a set stage they move through as they get older and solitary play has its place in life even as children become older. We usually hold parent/teacher meetings in late October/early November and I always stress how important it is when a child is happy in their own company and knows what they want rather than having to rely on others before they choose to play somewhere. It is a truly great quality to have already realised at the age of 3 or 4 that you are responsible for your own happiness and contentment rather than waiting for others to fulfil it. Sometimes it's good to be alone in your own thoughts when you are surrounded by a large group of peers. In fact it can be more of an issue if young children make very firm friendships that exclude others or totally rely on each other and are lost if their friend is off sick or doesn't want to do exactly the same thing as them. So often that "X isn't my friend anymore' refrain actually means that X wants to play in the sand but Y doesn't. Or another child has managed to break into the previous solid twosome. When a sympathetic adult teases through some of those familiar refrains, it is more likely that the child claiming no-one will play with them, hasn't yet acquired the skills to know that you have to ask people to play with you or have the skill to know how to join in an already established game. Parents might watch a group of children all running around 'playing together' and wonder why their child is over playing on their own but in fact if asked none of those running around could tell you what they are playing, they are just caught up in the game of chase! Some children will make firm friendships very early on in nursery and it might well continue as the children progress up through the school whilst others will peter out as the children get older. In fact it is more common for young children to have very fluid 'friendships' as they test out most of their newly developed social skills.